Ryquell Armstead was injured during Temple’s blowout win over ECU. Temple played without running back Ryquell Armstead, who is among its top offensive performers, Saturday during a 24-17 win at Navy. Armstead is listed as day to day with an ankle injury, but he didn't practice Tuesday so his status is uncertain for Saturday, when Temple (4-3, 3-0 American Athletic Conference) hosts No. 20 Cincinnati (6-0, 2-0) at noon. Could all this have been avoided? 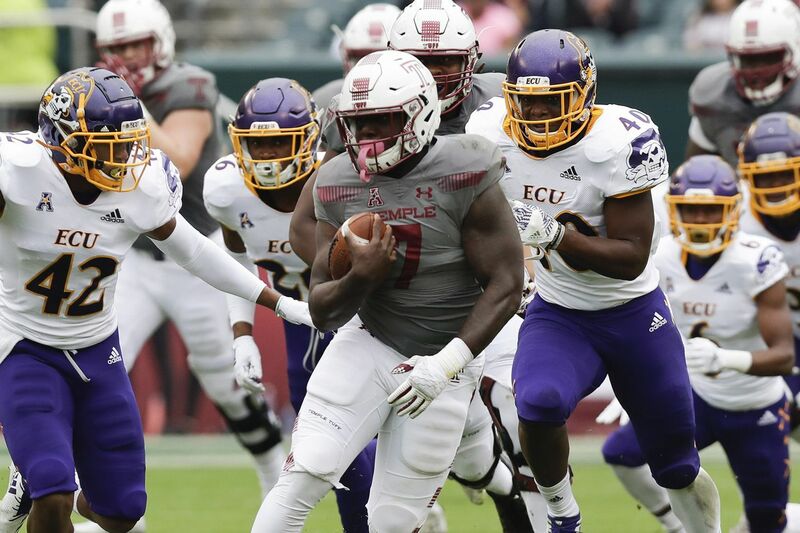 In Temple's 49-6 win Oct. 6 against visiting East Carolina, Armstead limped off with 5 minutes and 57 seconds left in the third quarter and Temple leading, 35-3. Last season, Armstead never missed a game, insisting on playing despite suffering from turf toe, and he wasn't as explosive as he was in his sophomore year, when he rushed for 919 yards and 14 touchdowns. Fast-forward to the fourth quarter Oct. 6, when Temple held a 42-3 lead. Armstead had re-entered the game and, on the first play of the quarter, was thrown for a 5-yard loss. But that wasn't the worst of it. He again limped off, this time for good after reinjuring the ankle. He finished the game with 91 yards rushing on 20 carries, snapping a string of four straight 100-yard games. Armstead wasn't available for comment because of the injury, so coach Geoff Collins was asked if he regretted allowing the senior from Millville, N.J., back in the game during a blowout. "We love having him out on the field," Collins responded. So would any Temple fan, as long as he is healthy. Then Collins told about a game in 2014 when he was Mississippi State's defensive coordinator. His team led LSU, 34-10, after scoring with 14:49 left in the game. LSU cut the deficit to 34-29 and then threw an interception on a Hail Mary pass as time expired. "Those experiences, you want to keep players in there throughout the game," Collins said. "In college football and especially in this league, I don't know if any game is secured until the last play." Still, ECU is no LSU, and it was especially true on Oct. 6. "Ryquell is a great player and is getting better every day, and those cumulative experiences as a coach flashed in your memory in situations like that," Collins said. What about that he was hurt and it was 42-3? "He was ready to come back in, he came back in, and it got twisted on that one tackle for loss," Collins said. "Ryquell Armstead is a competitor. We actually love that about him." None of that is disputed, but a coach often has to protect a player from himself. Collins didn't, and now Armstead remains on the sideline.